Would you be concerned if perfect strangers could track who you speak with most frequently, where you are and what you’re doing? If you have an iPhone, iPod Touch or iPad, you're probably already sharing that information with the developers of the apps you have loaded. To run effectively, many apps need personal information. But you might not realize the degree to which the apps you install on your iPhone or iPad give the developers who coded them a window into your activities. And sometimes these developers grab information from a mobile device that seems unnecessary for the basic functions of the app. Why, for example, does the game Jetpack Joyride from Halfbrick need to be able to look at the photos my 10-year-old takes using his iPod Touch? It turns out the game lets people take screenshots of their gameplay, which seems valid. Still, Apple warns that photos stored on the device may contain metadata such as when and where they were taken. While I’m sure the folks over at Halfbrick are fine people who don’t intend to spy on my kid’s location, what about the zillion other programmers out there grabbing who-knows-what information about people’s activities? If the idea of strangers knowing what you’re doing with your mobile device bothers you, you can easily find out what they can see and make adjustments to the permissions you’ve given them. What Permissions Should You Watch? 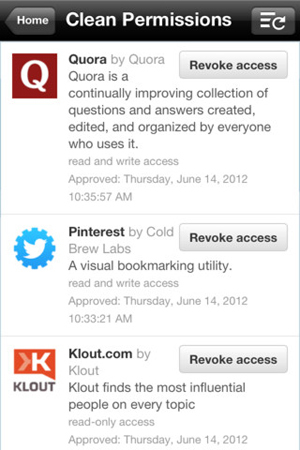 Which permissions should you pay closest attention to? I checked in with Michael Gartenberg, an analyst with the technology research firm Gartner, who says the things most people should focus on are location, contacts, calendar and photographs, especially if you have data in any of these buckets you don’t want anyone knowing about. At the same time, it’s important to realize that many apps only request this information so as to work properly. “I can use an application like Google Maps but in order for it to work it’s got to know where I am, meaning I have to give it permission to go ahead and [use my GPS information],” Gartenberg says. “If I want something to integrate my contacts with my social network I’m going to have to give that application permission to access my contacts. If I want to upload my photographs to Instagram I have to give Instagram access to my photographs. So there’s a lot of different settings that are out there and consumers have to consider [the tradeoffs]. For example, in the case of navigation apps, yes, by approving location permissions you’re giving companies a wealth of data about your whereabouts. In exchange, you get free maps and directions. The degree to which you’re comfortable with that exchange is only up to you. “Most of it really comes down to conscious awareness—not just clicking OK because an application asks to do something but trying to make sure to understand what it is the application is doing, what it’s asking for and why it’s doing so,” Gartenberg says. The good thing—and where iOS blows Android away—is that with its latest operating system Apple got a lot stricter about app permissions. “Things are much more specific. The first time I want to upload a [a photo from] my pictures library to Instagram [it’s] going to bring up a pop-up and explicitly say ‘This [application] wants access to your photos—do you want to give [permission]?’”Gartenberg says. “If something wants access to my contacts or my calendar I’m going to get explicit messages, so iOS is doing a better job of exposing these things. The first thing you should do is make sure you’re running Apple’s latest operating system, iOS 6 (scroll to the bottom of this page from Apple to see which devices are compatible with it. Essentially is any iphone earlier than iPhone 3GS, iPod touch earlier than gen 4 and first gen iPads aren't upgradable). If you’re not sure which version you’re using, go to Settings>>>General>>>About>>>Version. If you’re not sure why you should upgrade to iOS 6, read Why Updating Your Software is a Must Do. Assuming that you’re running iOS 6, just go to Settings>>>Privacy and you’ll see a list of things Apple lets developers track: Location Services, Contacts, Calendars, Reminders, Photos, Bluetooth Sharing, as well as access to Facebook and Twitter accounts. You can click on each one to see which apps have requested access to glean relevant data in these areas. On my son’s iPod Touch, for example, I can click on Photos and then turn off Jetpack Joyride’s ability to see his photos. There’s also a nifty iOS app you can install on your device that figures out which apps you have connected to various online services and which permissions you’ve given them. It’s called Permissions (free in the Apple iTunes store), and within seconds determined that 60 of my installed apps have access to my Facebook account. If you’ve ever used Facebook to log-in to a web site, for example, you’ve given that site access to your account. Permissions also showed me that one of my favorite websites, a home remodeling site called Houzz, has permission within Facebook to access my basic information, send me email and post on my behalf. That last permission is a prickly one for a lot of people, so Permissions gives the option to turn it off, change which kinds of people could see any such posts or remove the app entirely. Keep in mind that you can manage your Facebook app permissions within Facebook itself just by going to Settings (the little cog on the top right of your Facebook page)>>>either Account Settings or Privacy>>>Apps. From there you’ll see a list of all the apps and websites that have access to your account. For each one, you can change the permissions by clicking on Edit. What’s nice about the Permissions app, however, is it gives you a window into a dozen networks all in one place, including Facebook, Twitter, Google, Box, LinkedIn, Yahoo, Windows, Instagram, AOL, Foursquare, Flickr and Familio, although the latter is just a link to getting the Familio app, which is a private social network for families. Useful article although it seemed to turn into a slight advert for iOS over Android without seeming to explain why iOS ‘blows Android away’. In Android, developers have to explicitly list the permissions that they wish to access on the device. When installing the App the users are then explicitly told which ones these are and they can choose whether or not to give those permissions for that app. Developers are then more likely to justify each permission in the Play store. I don’t see how interrupting operation of the app to ask the same question is any better. Nice article though, but that was abit childish to compare ios and android together when it comes to permissions. And when you are talking about vulnerable, have you read any news lately? When installing app from playstore/amazon store, it always tells you the permission the app needs. And it’s your choice whether to install or not. if you are concerned about privacy, then you would avoid all i-devices. Why? Because ios7 came with some new better privacy mode but also it went back in the same category. If you are really concerned about privacy, as we all should be, I recommend not to install any free apps. Most of them are leaking and collecting almost everything because they get mlney from ads etc. Better to get only paid version, they have less permissions and most of them not collecting info to send 3rd party. Something to remember when getting new i-device. There are also many pages which guide you to do necessary first steps with i-devices when getting them to make them safer. Unfortunately most of users dont know and live in hype that apple is safe to use. You should add some links to your article “Safety tips for ios7 privacy” =) Because if you dont change these settings immediately, you will leak all the info they want to collect from you.